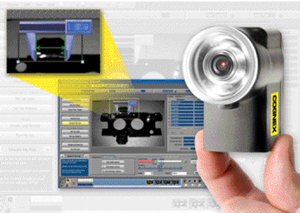 Cognex Corp. has expanded its Checker vision-sensor product line with the Checker 252 model. The 252 includes all inspection capabilities of the Checker vision-sensor family, plus additional software sensors that verify height, width and diameter, and deliver reliable pass/fail results on high-speed production lines. Checker vision-sensor product Key to model’s simplicity is its One-Click Setup. By simply clicking on the center of the part feature to be inspected, an image of a familiar caliper appears automatically and locks on the edges of the part feature, sets the minimum and maximum thresholds, and learns edge polarity. With the new Checker, manufacturers can verify dimensions of parts with low-contrast edges and solve a range of measurement-verification tasks not possible with photoelectric sensors, according to Cognex officials. As with other Checker models, it is available with the Cognex SensorView 350, a compact, industrial panel-mount display.